Scrub Hub Club membership provides benefits beyond the everyday discount... Join today and start saving on the latest and greatest in Scrubs. Scrub Hub brings our Stores to you. Scrub Hub on Wheels is a complete scrub store ready to be on-site at your location with the most brands, styles, and product. As an expert in the medical field, your scrubs are an extension of your care and professionalism, but that does not mean you have to give up your sense of fashion. Scrub Hub is here to provide medical scrubs with the comfort and style your busy work life demands, while allowing you to distinguish yourself as a medical professional. Scrub Hub is a uniform and scrub store that provides the brands and styles you want, with the functionality your field requires. 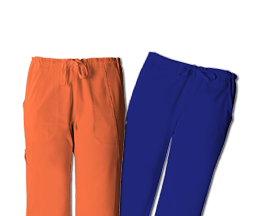 We have scrub tops, scrub pants, medical scrubs and so much more. Let your style shine through your choice of scrubs and check out the different brands and style options that we have available. Do you need scrubs that fit your style? At Scrub Hub, we are committed to quality, but that does not mean we skimp on style. Scrubs can be flattering and functional, which is why we carry such a large selection of scrubs. Careisma by Sofia Vergara, Heartsoul Scrubs, Med Couture, and Sapphire are just a few brands of scrubs that we carry. We also carry different types of scrubs such as, Cherokee, Dickies, Grey’s Anatomy and much more. Each style of scrub fills different style needs as well as being functional. 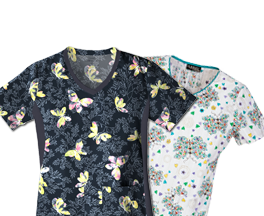 All of our scrubs for women and men are designed to be comfortable and functional, making your job easier. Pick out a pair of scrubs that best fits you and your style. Everyone will be dying to know where you got them! Scrubs are only the beginning! Our company understands that in the medical field you need more accessories than just scrubs, so why not shop for quality materials at Scrub Hub? Your job is demanding and you work long hours, which is why you need accessories that will last and get you through the day. Scrub Hub has a wide selection of nursing shoes, medical bags, stethoscopes, penlights, scrub caps and other quality medical accessories you can rely on. For more information, or if you want to learn how our uniform and scrub store locations or mobile scrub stores can help with your personal or group medical uniform needs, contact one of our five convenient locations.